Are you aware that if you have Windstorm/Hurricane coverage on your homeowners’ policy, you may also have a separate Hurricane Deductible? Do you know how a Hurricane Deductible impacts your claim? Do you know when it applies to a claim? Florida laws are very specific regarding when the Hurricane Deductible applies, for what duration of time and how many can be applied in a calendar year. Review the resources below to better understand how a Hurricane Deductible can impact your claim. The Palace of Fine Arts was initially built for the Pan-Pacific Exposition in the 1930s, heralding San Francisco's rebirth after the 1906 earthquake. A few short miles from downtown San Francisco, horses roam in the fields of Marin County, California. Marin County is blessed with acres of open spaces, both public and private. Orchids from all over the world can be seen in the Arboretum in Golden Gate Park. All Peril Deductible: the amount of money a policyholder must pay out-of-pocket toward damages or a loss before their insurance company will pay for a claim. If you file a claim and it is covered, the deductible is subtracted from the amount paid by the insurance company. Coverage A / Dwelling Coverage: A dwelling is a building occupied primarily as a private residence. The dwelling coverage also includes structures that are attached to the dwelling; such as, a garage, a deck, patio, or porch. Declarations Page: the declarations page, also known as the Dec Page, is the first page of a policy that contains the specific policy information. For example, the name of the insurance company, policy number, the different types of coverages included in the policy, coverage limits and coverage costs. The Dec Page also outlines the policy forms, endorsements, supplemental coverage(s) and the deductibles. Additionally, the Dec Page also includes the name and mailing address of the policyholder, the physical address of the insured property, if different than the mailing address, and the name, mailing address, and contact information of the insurance agent who issued the policy. Hurricane: a storm system that has been declared to be a hurricane by the National Hurricane Center. Hurricane Coverage: coverage for loss or damage caused by windstorm during a hurricane. The term includes damage to the interior of a building or to property inside a building, caused by rain, snow, sleet, hail, sand, or dust if the direct force of the windstorm first damages the building, causing an opening through which rain, snow, sleet, hail, sand, or dust enters and causes damage, anywhere in the state of Florida. This does not include coverage for flooding. Hurricane Deductible: the amount noted on the policy Dec Page, which is paid by the policyholder before an insurance company issues any payment for damage caused by a Hurricane. The deductible amount is generally subtracted from a claim payment prior to the issuance of the check. Hurricane Deductible Option: the varied dollar or percentage choices available under the policy contract. Hurricane Watches and Warnings: alerts regarding the approaching storm system. Watches are issued 48 hours in advance of the anticipated onset, and warnings are issued 36 hours in advance of the onset of tropical storm force winds within a specified area. Hurricane Coverage Exclusion: all insurance companies authorized to issue property insurance by the Office of Insurance Regulation (Surplus Lines are not included), must make an exclusion of windstorm coverage available. The coverage may be excluded if the policyholder personally writes and provides to the insurance company the following statement in his/her own handwriting and signs his/her name, which must be signed by all named policyholders on the policy: “I do not want the insurance on my (home/mobile home/condominium unit) to pay for damage from windstorms. I will pay those costs. My insurance will not.” If there is a mortgage holder or lien holder, they must give their written permission for the coverage to be excluded. This is allowed by, and subject to regulations outlined in s. 627.712(2)(a)1. and 2., Florida Statutes. 2. The “all peril” deductible as stated on the policy. If the hurricane deductible was met in full with the first covered windstorm claim, the “all peril” or standard deductible would apply to other windstorm claims resulting from a hurricane that occurs in the same year. What is the definition of a Hurricane for insurance purposes? A hurricane is defined in s. 627.4025(2)(c), Florida Statutes, as a storm system that has been declared a “hurricane” by the National Hurricane Center of the National Weather Service. What is the definition of Hurricane Coverage? “Hurricane coverage” is coverage for loss or damage caused by windstorm during a hurricane. The term includes damage to the interior of a building or to property inside a building, caused by rain, snow, sleet, hail, sand or dust if the direct force of the windstorm first damages the building, causing an opening through which rain, snow, sleet, hail, sand or dust enters and causes damage anywhere in the state of Florida. This is also found in s. 627.4025, Florida Statutes. When does the Hurricane Deductible apply? 2) Ending 72 hours following the termination of the last hurricane watch or hurricane warning issued for any part of Florida by the National Hurricane Center. What are the Hurricane Deductible options? All insurance companies must offer Hurricane Deductible options of $500, 2 percent, 5 percent, or 10 percent of the policy dwelling or structure limits, unless the specific percentage deductible is less than $500. 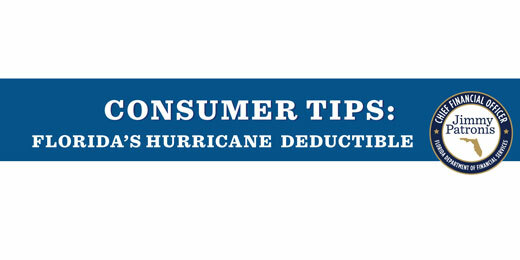 The Hurricane Deductible must be listed as a dollar amount, even if the deductible is listed as a percentage amount. 1) Dwellings insured for at least $100,000 through $249,999: an insurance company may offer a policy that guarantees that the company will not non-renew the policy in order to reduce the hurricane exposure for one 12-month renewal period. However, the policy may include up to a 2 percent Hurricane Deductible. 2) Dwellings with insured limits of $250,000 or more: The insurance company does not have to offer the option of a $500 Hurricane Deductible. b) If the insured structure has a mortgage or lien, the policyholder must provide the insurance company with a written statement from the mortgagee indicating the mortgagee approves the policyholder electing to have the specified deductible. This is allowed by, and subject to, regulations outlined in s. 627.701(d)1(a) and (b), Florida Statutes. How is the Hurricane Deductible Applied to my policy? The single season Hurricane Deductible applies to personal lines residential property policies. The provision states that after the first Hurricane Deductible has been applied, the deductible for the second hurricane (during the same year) will be the greater of the amount left over from the first Hurricane Deductible, if the deductible had not been met or the “all peril” deductible. If the Hurricane Deductible was met in full with the first hurricane claim, the “all peril” deductible would apply to other hurricane claims that occur the same year. Commercial residential policies, for example, condo association policies, must provide either a Hurricane Deductible as described above or one with a separate Hurricane Deductible for each hurricane. The Single Season Hurricane Deductible is not required under policies issued in the Surplus Lines Market. How Does the Inflation Guard Endorsement Affect Coverage and the Hurricane Deductible? Inflation guard is an endorsement added to most property Replacement Cost insurance policies which provides that the policy limits will increase a certain percentage at regular intervals. The inflation guard endorsement helps the amount of your coverage keep up with current construction costs. The Inflation Guard endorsement can affect the amount of coverage in force at the time of a hurricane loss and the amount of the deductible applied. It will only affect Hurricane Deductibles that apply as a percentage. This can change the amount a policyholder receives for a hurricane claim filed against their homeowners policy when the Hurricane Deductible is shown as a percentage. The insurance company must disclose on the policyholder’s Dec Page if the Inflation Guard Endorsement may cause the Hurricane Deductible to be higher than indicated when a loss occurs. Learn when the hurricane deductible applies during a windstorm through real life examples. Learn how Florida’s Single Season Hurricane Deductible applies during a multiple storm hurricane season. Learn how the Inflation Guard Endorsement can change the amount of your Hurricane Deductible and explore examples to understand its influence on your policy. Review these consumer tips on Florida’s Hurricane Deductible to ensure you are aware of what questions to ask to determine how and when it will apply.